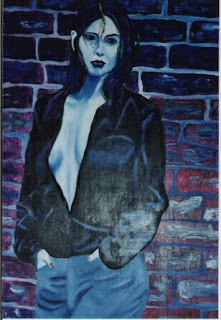 Ever since the internet came into play, in the mid-late 1990s, I have received (and stumbled across) various examples of fan art depicting Sonja Blue. Some of it I can assign a Real Life name to, while some only have email/online handles. So if I do not properly attribute a piece of artwork correctly, it is not out of malicious intent, but genuine ignorance. This is one of the earliest examples of Sonja Blue fan art in my digital collection (hell, the entire collection is digital). I no longer know who the original artist is, although I'm fairly sure it was a woman who may have used the pseudonym 'Pixie'. In any case, I'm reasonably certain this piece dates back to the late 1990s, early 2000s. 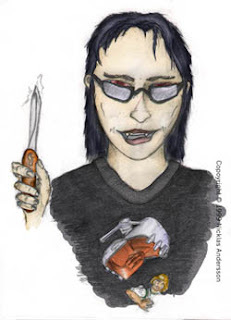 This is one is also amongst the oldest examples of fan art I have in my collection. It was drawn by Nicklas Anderson in 1999. I'll continue posting examples of fan art, as well as portraits drawn by professional artists, on this blog, and will try to identify the artists as best I can. If you recognize your art, feel free to chime in.